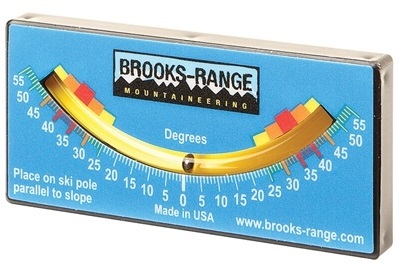 The Brooks-Range Slope Meter (commonly known as an inclinometer or clinometer) is an essential tool for backcountry skiing. It takes the guess work out of slope angle assessment, measuring the angle of a slope up to 55°. The meter is marked at every degree, and stabilizes quickly for fast reading. The Slope Meter contains a ball bearing suspended in oil that gravity forces to the lowest point of the meter. 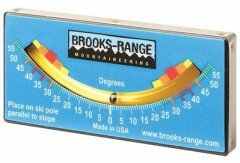 To use the slope meter, lay your ski pole on the snow pointing down the fall line. Then lay the Slope Meter on the ski pole to measure the gradient. The most dangerous avalanche angles are conveniently marked in red, orange, and yellow on the graduated scale. This handy multi-pupose tool also features a black screen on the back that makes quick work of snow crystal analysis by providing 1 and 2 mm grids to measure crystal size and shape.